To pull the desired data from the full set of statistics, you can create a segment. A segment is formed from criteria that are used for selecting data. The criteria are combined into groups in the list, and groups are combined into categories. A mobile provider has added a calculator for service rates on its website. 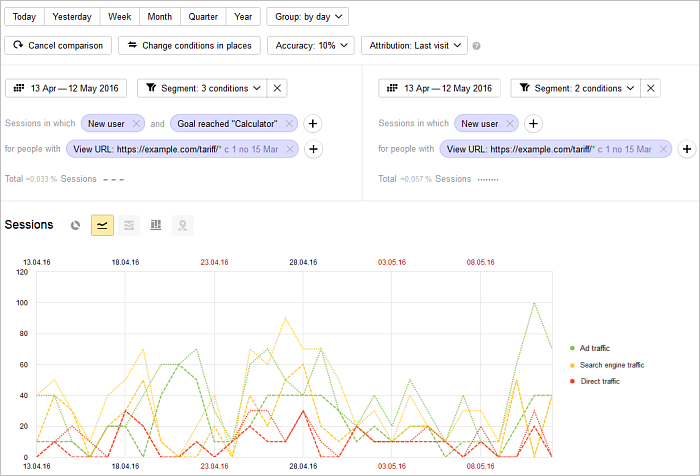 To evaluate the effectiveness of the new tool, we need to compare statistics for users who used the calculator with those who didn't (for example, over the first 14 days after introducing the tool). It will also be helpful to evaluate traffic sources. Segmentation can help us do this. Let's assume that the tag already has a goal created for interaction with the rate calculator (“Calculator”). Choose the condition: History → New/returning user → New user. Click Apply. Pull out sessions where the “Calculator” goal was completed: Behavior → Goals reached, and choose the goal from the list. Click Apply. Then refine the data, leaving information about users who viewed the service rates pages with the calculator between March 1 and March 15. The rates pages are standardized on the site, and they all show the calculator. So the condition can specify the URL of the entire “tariff” directory by using the * symbol. Choose the condition: Behavior → View URL. Enter the URL of the directory with the service rates. Choose the time period for pageviews: click For reporting period, then Choose period. This gives you statistics on site users who used the rates calculator during a set time period in the past. Save the segment. Now let's get average data for site users. Delete the Goals reached condition and save the segment with a different name. Now you can compare the two segments. Attention. This feature is available in reports that contain information about user sessions. The value of the dimension will be the criteria for the segment. You can save the resulting segment to compare it with another one. For more information, see the actions with segments. You can also change the criteria. In the Entry pages report, select the corresponding line and click . The value of the dimension will be used as the criteria for creating a segment. The report will only show data about the selected page. 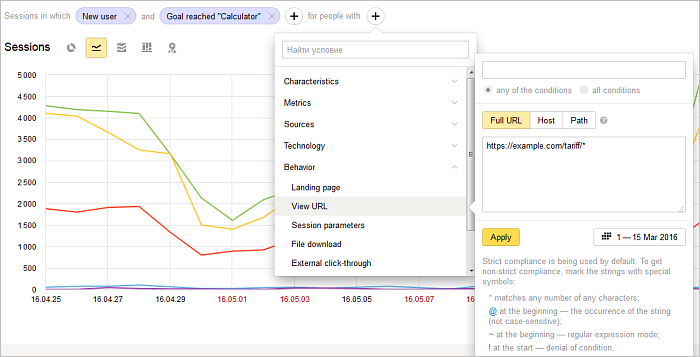 Click Dimensions and add Source → Traffic source. Move Traffic source to the top of the list. The data shows that the high bounce rate is for traffic from search results. To analyze the results more closely, click the Search engine traffic line. This opens a report for the created segment. For conditions from different groups, the service uses the “AND” operator. from the same group, the service uses the “OR” operator. Restriction. You can add up to 20 conditions. 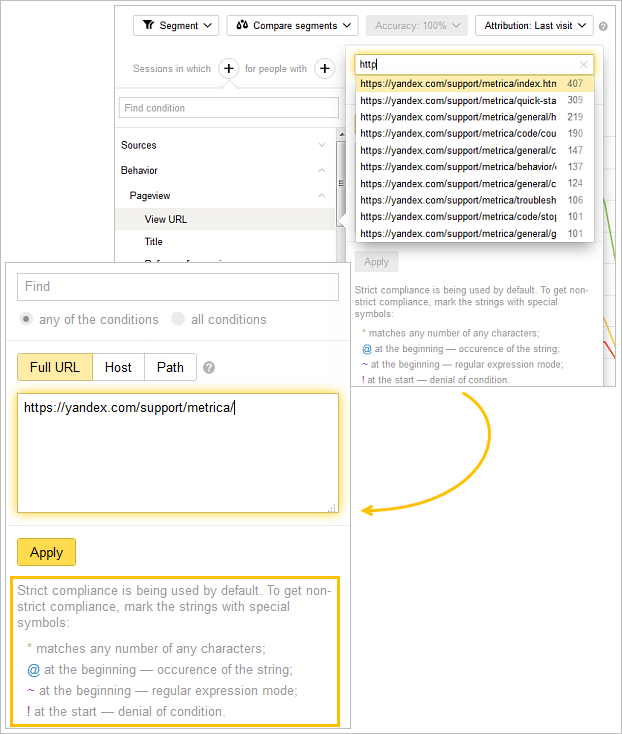 For example, conditions related to specifying a URL, page title, or search query. You can set these types of conditions in the text box. If you are setting multiple conditions, each condition must start on a new line. String conditions can also use special characters. If you don't want to specify a strict match, you can define the beginning, a substring, or more complex conditions using regular expressions. You can use the * character when setting conditions related to a search query. For example, you can filter all the search queries that brought visitors to the site and select just the data for phrases that somehow contain the company name: *Alice in Wonderland*. The following queries will match this condition: website of Alice in Wonderland; Alice in Wonderland site; official Alice in Wonderland site. When using special characters, case is ignored. For example, the Location category provides a variety of conditions to choose from. 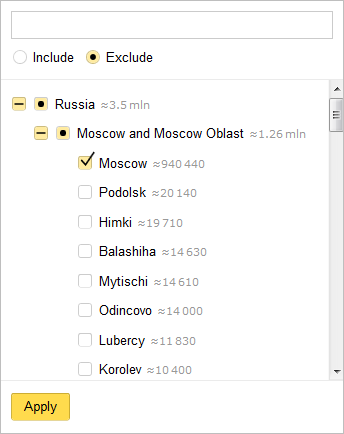 Our report will contain data for the Moscow region, without Moscow itself. 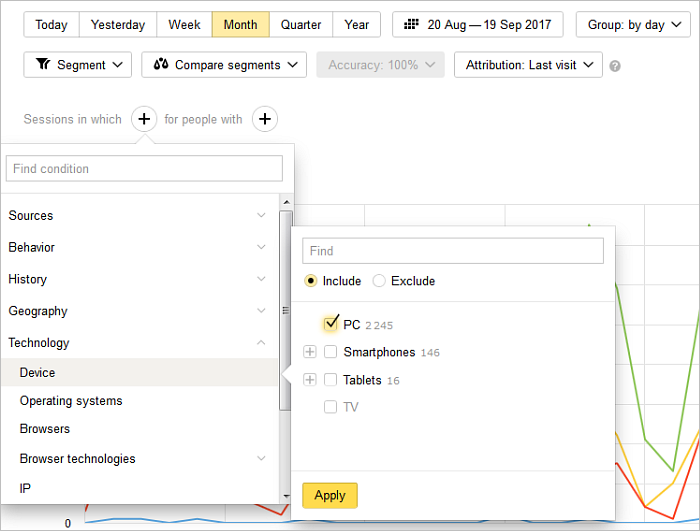 Comparison lets you view data for two segments at once. To save a set of conditions (a segment) that you like, click Save as and enter a name for it. You can find your saved segments in the menu under Segments → Saved segments, and in the Segments section. Restriction. You can save up to 500 segments.